This time on Across The Peak, Rich and I tell you have to perform basic vehicle preventative maintenance checks and services to keep you on the road. We open the show taking about what we’re drinking, and doing things the hard way versus doing things the smart way. In this episode we also introduce our ATP Vehicle Maintenance Logbook! Help you resell the car. Vehicle PMCS is a component of the idea of "taking care of your stuff." As competent and dangerous individuals, the gear we rely on on a day-to-day basis should be in a good state of repair. This is especially true for your car, which we rely on for safety, convenience, and livelihood. Rich and I just put together a logbook to help you with your vehicle preventative maintenance checks and services: the ATP Vehicle Maintenance Logbook! 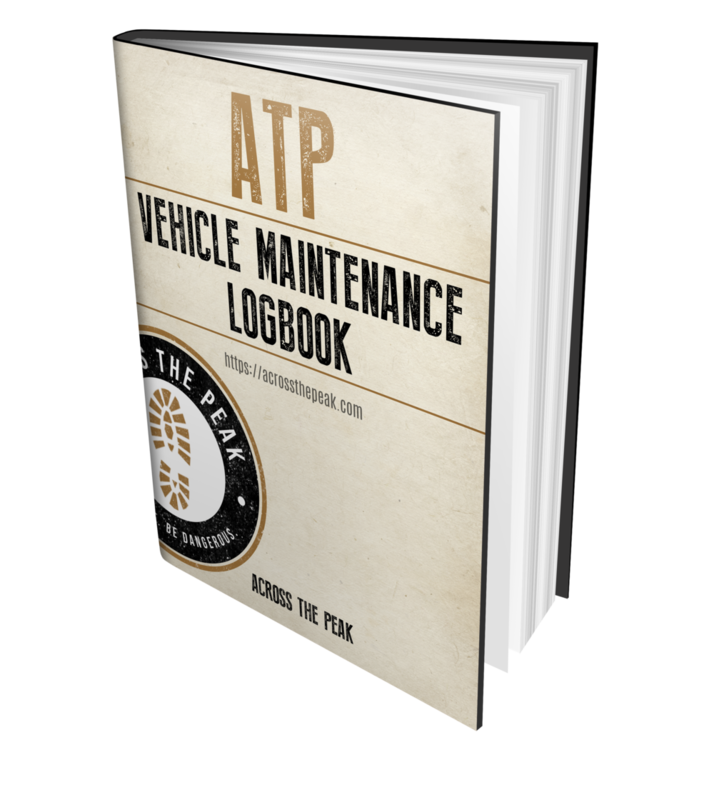 The ATP Vehicle Maintenance Logbook helps you in several ways. First, having a checklist provides motivation for you to get out and conduct vehicle PMCS. Second, it guides your preventative maintenance checks and services by listing the things you should check and keep an eye one. Third, the ATP Vehicle Maintenance Logbook helps you maintain a record of everything that has been done to your vehicle; this can help you when seeking corrective maintenance, in identifying little problems before they become big problems, and with resale of the vehicle. The ATP Vehicle Maintenance Logbook is available at Amazon.com. Free PDF! If you don’t want to purchase the logbook, I will provide pages that you can print out yourself. In the episode we mentioned a PDF download. Due to technical difficulties involved in getting a downloadable PDF on the site, we haven’t done this. However, if you reach out to us via the Contact page we will gladly email you a PDF containing one of each logbook page in the ATP Vehicle Maintenance Logbook. How Often: Weekly. Pick a time and day (like every Saturday morning) and stick with it. The other time you may want to deviate from your weekly PMCS session is right before a long road trip. Read the Owner's Manual: The owner’s manual will tell you what type of fluids, and in what quantities, are optimized for your vehicle. It will also provide part numbers for certain products like your air and oil filters. The owner’s manual will also provide information about recommended service intervals. 1. Fluids: The first step here is knowing what fluids your vehicle takes and how much. Windshield washer fluid: This might be the most important fluid in your vehicle for safety! Make sure you are using an product that is rated for your climate; if you live in a place that experiences extreme cold, you probably want windshield washer fluid that is rated for colder climates. Never use water as a substitute for windshield washer fluid. If it freezes it could damage the windshield washer fluid deliver lines. Anti-Freeze: check the reservoir. You should dilute anti-freeze 50/50 with water, but check the bottle first; a lot of antifreeze now is sold pre-diluted for convenience. We recommend you always keep a gallon of antifreeze and a gallon of water in your car. If your anti-freeze/coolant is consistently low, you probably have a leak and should get it corrected immediately! Quantity: Check your owner’s manual to find out how much oil your engine takes. Also check it to find out how to correctly read your car’s dipstick. Quality: used engine oil (in gasoline engines) will appear honey-colored to a dark amber. Oil that is deep brown or black is at the end of its life cycle and should be replaced. Brake Fluid: Make sure you have plenty of brake fluid in your car’s master cylinder. You may want to invest in a brake fluid test pen that measures the quality of your brake fluid. If your brake fluid is low, you need to seek repair immediately! Automatic Transmission Fluid (ATF): Transmission fluid should be bright red. Look for an ATF dipstick to measure the quantity in your car. 2. Battery: While you’re under the hood, take a look at your car’s battery terminals. They should be clean and free of corrosion. If terminals are corroded, clean them off with a wire bristle bush or battery terminal brush. This is how your battery terminals should look. This is how your battery terminals SHOULD NOT look. Coating the terminals with a little Vaseline may prevent this from recurring. Tires: Your life quite literally rides on your tires. There are a number of things you should look for in your tires. We discussed a lot of this stuff way back in Episode 6: How to Change a Tire. Remember, it is imperative that you check your tire pressure when the tire is cold (i.e., hasn’t been driven recently). Your tire’s recommended pressure. This can be found on the tire, in the owner’s manual, or on the information sticker one the body of you car, just inside the driver’s door. A tire pressure gauge. These come in a variety of flavors including dial readout gauges, digital gauges, or my favorite, the simple (and inexpensive) “stick” gauge. Check the tread depth. Your vehicle’s tires have built-in tread depth indicators. Ensure that these are below the tread. Check the wear patterns on the tire. This article will show you some bad wear patterns and what they mean. Tire rotation. You should have your tires rotated every 7,500 miles. This coincides with the oil change interval when using full synthetic oil, so have them both done at the same time. Follow manufacturer’s recommendations for maintenance intervals. Find an expert! Go to a mechanic that is licensed and insured. Find an expert NOW! Don’t wait until you need service to find a mechanic. Find that guy now!